The glut of gasoline has led to tankers being turned away at New York Harbor in recent weeks, diverted to ports in the Caribbean. However, even that did not resolve the glut on the U.S. east coast. “Record-high inventories in the region are now pushing prices low enough to turn the typical trade flow on its head,”Bloomberg reports. The east coast typically imports a lot of crude oil and refined products. But refined products are instead heading in the other direction because of the buildup in supply. This entry was posted in Commodities, Economic fundamentals, Energy markets, Guest Post, Investment outlook on February 21, 2017 by Yves Smith. So we have 70 degree days in February and 1979 gasoline prices. Like climate change, the contrapuntal effects of peak oil may lead to highers and lowers. Pretty soon all we’ll have left are the outliers. No, this is not even remotely enough to drive this level of inventory accumulation. And people still have to commute even in the rain. Yes, and with wet roads come numerous collisions that lead to traffic tie-ups and hours of engine idling waiting for the roadway to clear. Mileage might improve in the Summer, but Winter MPG is horrible. Well, the oil bears are on the prowl again. Meanwhile, I just got whacked with an eye-popping bill — nigh on $500 — for propane, which is increasing sourced from natural gas liquids rather than crude oil. Propane prices are quite sensitive to regional storage volumes. So we’re running out of gasoline storage? Let the peasants buy more monster pickup trucks! And, to top it all, we have record longs in crude futures and minimal shorts. Trump reflation better come soon. Saw a bar chart yesterday that showed extraction costs of domestic US oil producers have declined significantly. This was surprising to me as it seems to run counter to the mantra of the Return on Energy Invested crowd. The demand lows this year, are at odds with other consumptiom indicators? According to the graph the late 2016 drop is the largest in the last 7 years. Only the late 2011 drop resembles somehow the magnitude of the drop this year. But then, gasoline was way more expensive than today. It must be the weather, musn´t be? i said weather too when looking at early January numbers, but now with 5 weeks of low demand that seems unlikely, given a milder than normal winter for most of the country..
Its really interesting, and it does seem to be part of a pattern of confirmation of the predictions that some Peak Oilers made that we are entering a period of widely fluctuating oil prices, with alternating gluts and shortages as demand refuses to respond to price signals. I wonder though if a drop in gasoline is usually a leading or trailing indicator for the economy? This seems an outlier compared to other indicators of stress in the ‘real’ economy. Especially as there has been a recent boom in the sales of gas guzzlers. But maybe people are buying them, but for one reason or another are not driving so much. But why on earth should demand respond to price signals? I’m sorry if this is a naive question, but I really don’t see it. It’s one thing if high prices force people to find other solutions for transportation and lower demand, but if they have solutions that satisfy them they aren’t going to increase their use just because prices fall. And if more people are sticking to mass transit because of other economic stresses, of which there are plenty, the use is fixed: MTAs don’t add buses to the schedule when gas prices fall. 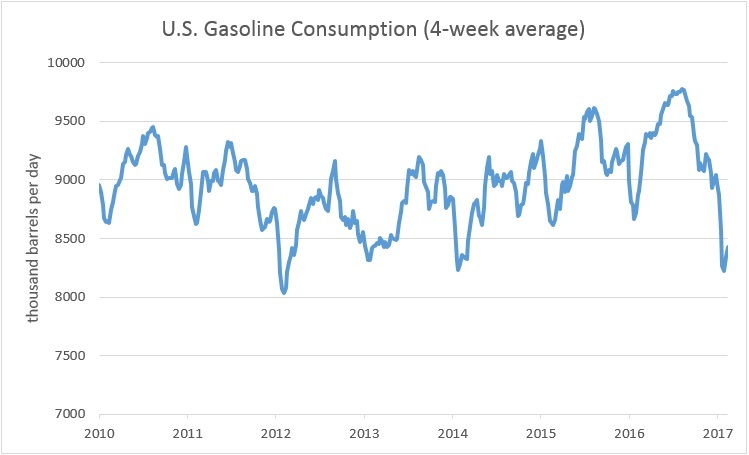 You are right that a sudden drop in gasoline prices can only have a limited impact on increasing ‘core’ demand, but there is plenty of flexibility within certain bounds, especially if demand has been surpressed by poor economic performance, or very high prices. Historically, people do drive more and buy bigger vehicles when pump prices are low, and there is an element of ‘switching’ energy modes according to price among industry and commercial transport users who have different options. But from my limited knowledge of the topic, it seems that (as was predicted by some), this link would weaken over time as overall economic demand stagnated. I came across a related datum (or anecdote, if you prefer) recently: road renewal has been paused in my neighborhood (for the third time since it started a year ago). An email to the homeowners from the construction company explained that there was a shortage of tar. Why was there a shortage? The answer given is that the local refinery is idle because demand for fuel is down. And, of course, tar is a byproduct of refining. Doesn’t gasoline degrade much faster than crude oil when in storage? If so, we are in for a downright crash in gasoline prices later in 2017, when refiners desperately try to sell the stored gasoline before it goes bad. If there is such a glut of gasoline, then I suppose refiners produced so much because some other oil-derived product is essential for the economy, so they could not just store crude away, and hence they could not avoid the gasoline “by-product”. What could it be? I’m curious to hear an answer as well. I’ve been told anecdotal info that a year is too long for storing gasoline. Any intelligent NC readers have any insight? Yes. Gasoline, especualy ethinal fuels do go bad. The problem is that they will become contaminaed with water over time, reducing the power the fuel can produce when burned as well as causing carosion for engen parts. Like grain and other parishables, it passes through grades as it gets older. With additives and blending with other fuel grades extending their shelf life, but making it less desirable and their by cheeper grade of fuel. I looked up some information at the API (American Petroleum Institute). It turns out that over 95% of all gasoline is blended with ethanol (usually at 10%). Because ethanol is hydrophilic there are any number of contamination problems including (due to the presence of water) microbial contamination. Apparently, managing these storage tanks is pretty intense and gets more difficult over time. Diesel fuel gets bad also, algae and junk, always carry a spare fuel filter or two. Learn the basics of how to change one and carry the necessary tools with you as you travel. Yes, you often get gluts of ‘fractions’ because of demand for other parts of crude. A surge in construction for example can lead to extra demand for diesel, with a consequent increase in the supply of gasoline. But I don’t see from the figures any evidence of this happening, it does seem a straighforward case of refiners being too optimistic about demand. But storing refined products is always very problematic, they’d usually prefer to sell cheap rather than pay for storage. Reaching a tipping point for solar and electric cars. Listen to a You Tube of Salim Ismail of Singularity University. Markets are forward looking. Good news for consumers. Bad news for energy companies, traditional car companies, utilities and the Middle East. I seem to recall reading that the US hit “peak car,” as measured by miles driven, a decade ago. Looking at the graphs, it strikes me that the late winter-early spring of several years looks roughly isomorphic to this one, with 2015-2016 being the closest parallel, excepting the precipitous fall off and lag in demand that looks to set 2017 apart. 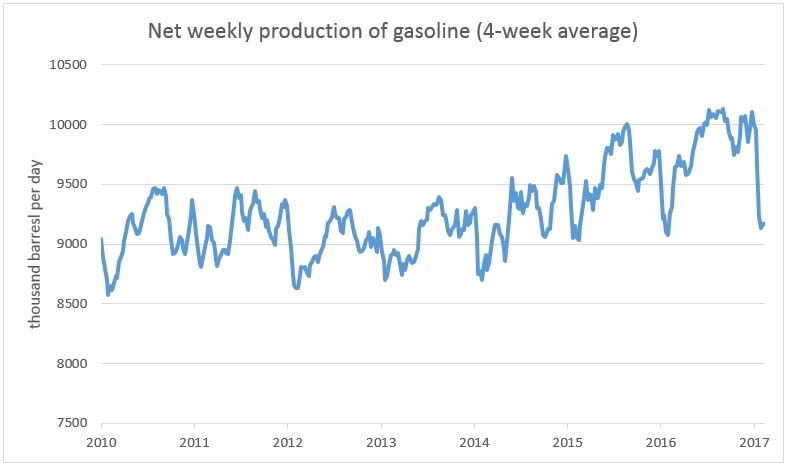 It does not surprise me that gasoline demand fluctuates seasonally, with spikes in the summer months and valleys in the winter, so that it would be typical to find storage at its highest point right before demand starts to build later in the spring. But I like others wonder if the seasonal effects of climate change might be starting to affect the demand cycle, which may be more structurally complex than higher temps=higher consumption. Unless I’m missing something I don’t see how climate change can impact on gasoline demand – there is an obvious link with heating oil and natural gas, but I don’t see how different weather during spring could impact on driving patterns to such a large degree. What about a possible impact on supply? I recall reading somewhere that refineries shift more from gasoline to fuel oil going into winter. Have they been doing less of that because of the expectation of milder winters, or the loss of business to other heating fuels? With respect to the gasoline stocks, there is nothing to see here. Where ending stocks are now is precisely where ending stocks seasonally were exactly one year ago. No alarm bells should be going off. And, to understand the recent rise in ending stocks that began in Dec 2016, all you have to do is recognize that US producers took the Nov 30 OPEC decision to cut production as a “signal” to ramp up production again to record levels. It’s a victory lap of sorts for US producers – to shutter production until OPEC cuts, then resume business as usual production rates. The company I work for has decided to fully embrace the work from home movement. Hurricane Sandy played a big part in changing minds about how and where people work. And we employ between 4K to 5K people. That’s a lot of cars taken off the habitual gas line. Strange. I see gasoline prices increaseing not decreasing at the pump on SC. New cars are so ugly, that when people buy them and and look at them in the driveway, they are aghast and hide them in the garage to be driven as little as possible. Combine that with the attention given to bitching about Donald Trump on social media, and we have colossal demand destruction. One of the biggest-if not the biggest consumers of oil/gas in this country is the military. Since the war activities have scaled back from what they were a few years ago-the prices have not risen to what we were accustomed to a few years back(thankfully) All those drones don’t consume as much probably. Pretty soon we might expect something to happen(?) I hope not. @old flame I love your comment, “all those drones don’t consume as much fuel.” I also love how lower fuel prices is a great example of when “pricing signals” don’t work! Some are obsessed with gas prices: “Why don’t lower gas prices make people drive more?” when the real drivers are all the other costs of vehicle ownership. A “Reaper Drone” is much cheaper than a F-35, but it also uses far less fuel. People stop driving cars, or drive less because they cannot afford all the other costs of the car (purchase/maintenance/insurance/registration), not because they cannot afford the gas. I haven’t owned a car for 5+ years even though I have a small service business. I “make do” with rental vehicles, Uber, and Lyft. I think “Peak Miles Driven” was in 2005(? ), and there are many like me who now drive or ride far fewer miles than 12 years ago. Hence lower demand for fuel, and I think that demand will continue decreasing despite lower fuel prices. Buying, maintaining, insurance costs are so out of reach. People can’t afford it let alone the gas. I’ve seen 10 year old vehicles go for $8000 sometimes more. Good grief. People have trouble to work on their own cars. That river of water that now crosses the Pacific Ocean and hits the US west coast doesn’t just hit one little area, it hits the entire coast. The pictures of these monsters have been amazing. We are now into the 5th storm, that’s 5 big ones, in only about a month’s time. The whole western region is getting clocked. I think it does have stg. to do with the gasoline glut bec. -for instance- Portland Oregon just shuts down in winter storms, usually because nobody likes to swirl around on all that black ice; California has been so flooded it’s dangerous to drive anywhere, and inland cities as far as Denver have been so clogged with snow that dump trucks and back hoes are out in force, but not many cars. A month of this onslaught, and counting. Gasoline consumption is down because the average MPG for the entire fleet of autos in the USA is up. This includes hybrids, which have killer MPG ratings. Approx 1 million pure electric plug in vehicles, EVs, with a growing trend based on over 300,000 Tesla pre-orders with a $1,000 cash down payment per pre order, and the mystery is not so mysterious. The former OPEC and Saudi Oil minister has said in Bloomberg interviews, it is peak demand that is his big worry, not peak oil. So, it’s the demand side, stupid! Not the economy in this case. With over 50 million brand new cars sold in the past 3 years, approx 20% of total cars and trucks on the road in the US, older clunkers are being scrapped replaced by higher mileage, newer operating engines. To travel 100 miles today, cars and trucks burn 20% less gas on average. It isn’t only productivity going up in farms and factories, our transportation is more productive, going more miles with less fuel. And each new EV will drive that at an accelerated rate, due to ZERO gasoline needed. I like your Avg. MPG explanation. …assuming its usual inexorable upward slope since the GFC. I’m waiting for the geezer deluge from the subs. to the cities to finally put the kibosh on the upward action.